Oriental noodle dishes are all about the broth. There’s no doubt that noodles are an important facet, but the flavour comes from the broth, and chef-proprietor Ross Shonhan champions this fact with his noodle house Bone Daddies where he serves up noodles in bone-cooked broth as is typical oriental tradition. Shonhan has spent some time at both Nobu and Zuma so Japanese-inspired flavours are old hat for him. 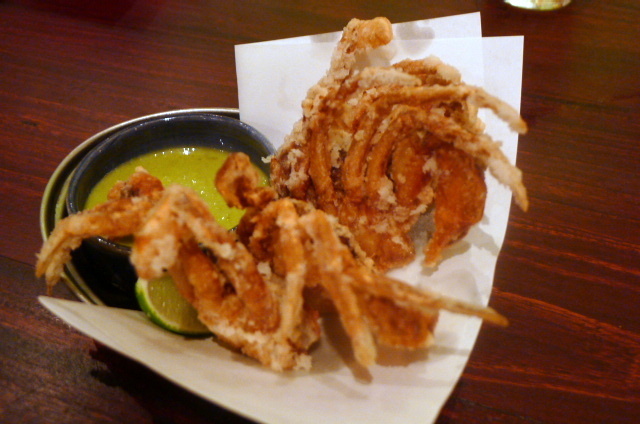 From the starters, a soft-shell crab (£8) was meaty, nicely cooked and very tasty. The spiciness in an accompaniment of chilli and ginger sauce was great, and it added a sparkle to the shellfish. The batter wasn’t thin in a tempura-kind of way, but it really worked with the crab. 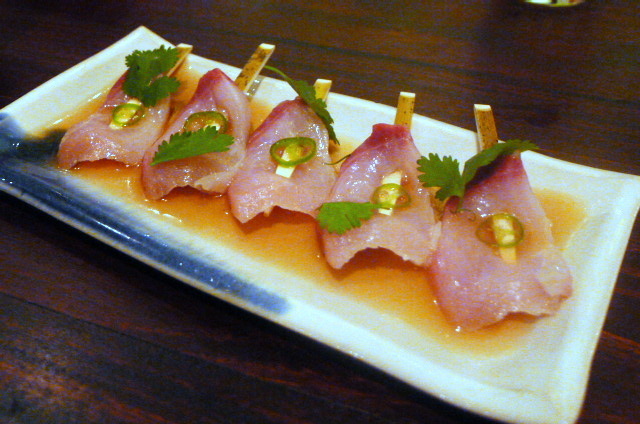 Yellowtail sashimi with chilli, lime, soy and coriander (£9) was decent but not particularly memorable. The fish was fresh, albeit a little bland, and there wasn’t enough zing or aroma in the sauce. A little bit more sparkle was needed to lift this dish. 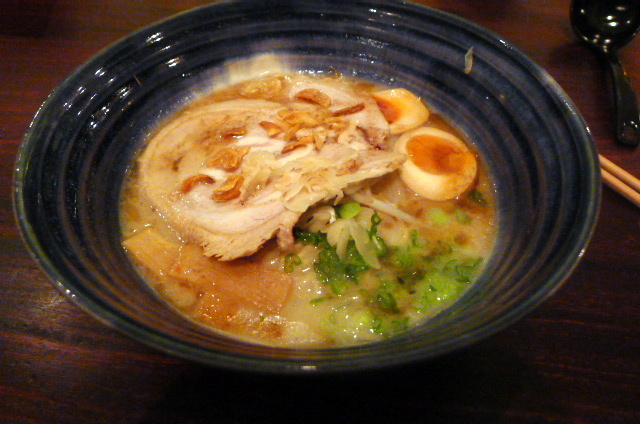 Arguably the signature broth of Bone Daddies is the 20-hour cooked pork bones broth in a tonkotsu ramen (£11). I looked forward to trying this with relish but found it a huge disappointment. The broth was very, very fatty and cloudy (as you can tell from the picture). As such it lacked clarity of flavour and all one got was the aftertaste of fat. It proved a huge letdown and barely rated on the authenticity scale. 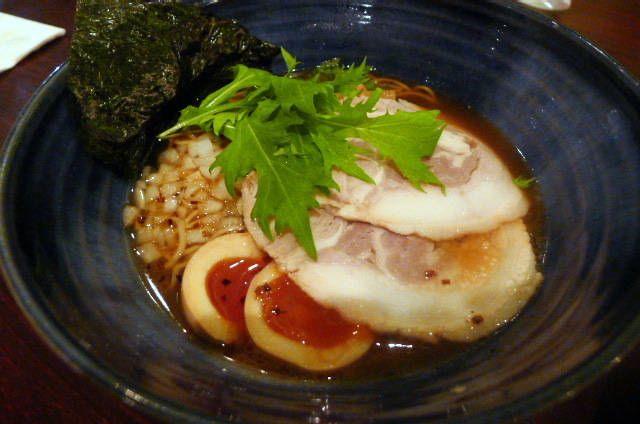 It came with chashu pork, a slow cooked rolled pork belly that was delicious but which was again quite fatty. Spring onions, bamboo, bean sprouts, and a runny, but salty egg completed the dish. The noodles were well made with the right level of firmness and were slightly springy in texture. A much better noodle dish was the soy ramen with chashu pork, mizuna, onion and nori in a chicken bone broth (£9) as the broth was lovely. It was clear and boasted of a good intense flavour that was striking for its clarity and sweetness. This was a high quality broth which only served to highlight my disappointment in the less than impressive quality of the 20-hour cooked pork bones version. The service was ok. Our waiter was on his second day and he didn’t appear to know much about the food. We also asked for water which got overlooked. The place was cramped and there was little space between the communal tables so you constantly got bumped. Bone Daddies has certainly found its calling in the market as the restaurant was packed when we went. There were long queues for the dinner service so it’s best to go early as there is a no booking policy. But for me, Bone Daddies was a mixed bag. There were obvious signs of great technique and good flavour in some dishes, but less so in others. I was let down by the not-so-great pork broth but charmed by the skill in the chicken bone one. Concept wise, Bone Daddies is good. And it’s also cheap. You just have to know what to choose and stick to that. Chicken bone broth seemed best. Prices: About £20 a head for a starter and noodle dish. Excludes drinks and service.